ABC is all ready for the new year. 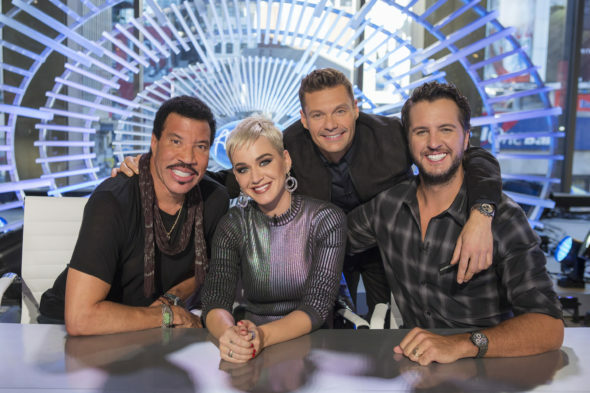 Today, the network announced the 2019 return dates for several TV shows, including American Idol, Match Game, and For the People. The new year will see the season two premiere of ABC’s American Idol reboot on March 3rd at 8 p.m. ET/PT, the return of Shark Tank on January 6th at 10 p.m. ET/PT, and the season two debut of For the People on March 7th at 10 p.m. ET/PT. The ABC Television Network will premiere the new dramas “Whiskey Cavalier” on WEDNESDAY, FEB. 27 (10:00-11:00 p.m. EST); “The Fix” on MONDAY, MARCH 18 (10:00-11:00 p.m. EDT); and “Grand Hotel” on MONDAY, JUNE 17 (10:00-11:00 p.m. EDT). Returning drama “For The People” will debut Season 2 on THURSDAY, MARCH 7 (10:00-11:00 p.m. EST). Following its highly anticipated winter finale airing tonight (10:00-11:00 p.m. EST), “A Million Little Things” returns on a new night, THURSDAY, JAN. 17 (9:01-10:00 p.m. EST). In alternative and reality programming, “America’s Funniest Home Videos” expands to two hours starting SUNDAY, JAN. 6, followed by a two-hour block of “Shark Tank.” “AFV” starts the evening with a fan-favorite, previously aired installment (7:00-8:00 p.m. EST), followed by a new episode (8:00-9:00 p.m. EST). The family fun continues with “Shark Tank,” featuring one original episode (9:00-10:00 p.m. EST) and one previously aired edition (10:00-11:00 p.m. EST). ABC will launch its second season of the iconic “American Idol” on SUNDAY, MARCH 3 (8:00-10:01 p.m. EST). When “American Idol” premieres, “AFV” original episodes will return to 7:00-8:00 p.m. EST, and new editions of “Shark Tank” will air 10:01-11:00 p.m. EST. A new season of “Match Game” premieres WEDNESDAY, JAN. 9 (10:00-11:00 p.m. EST). As previously announced, the spin-off comedy “Schooled” also debuts on Jan. 9 (8:30-9:00 p.m. EST), immediately following “The Goldbergs” (8:00-8:30 p.m. EST); and “American Housewife” returns on its new night, TUESDAY, FEB. 5 (8:00-8:30 p.m. EST). Eight weeks of two-hour “20/20” programming kicks off on FRIDAY, JAN. 4 (9:00-11:00 p.m. EST), and features brand-new interviews with key players in the biggest newsmaker stories in recent American history. Each documentary takes a look at these cases through a modern lens, challenges original perceptions, and sheds new light on each story. What do you think? Do you watch ABC? Which TV shows will you watch in 2019? More about: A Million Little Things, A Million Little Things: canceled or renewed?, ABC TV shows: canceled or renewed?, America's Funniest Home Videos, America's Funniest Home Videos: canceled or renewed?, American Idol, American Idol: canceled or renewed?, Black-ish, Black-ish: canceled or renewed?, For the People, For The People: canceled or renewed?, Fresh Off The Boat, Fresh Off The Boat: canceled or renewed?, Grey's Anatomy, Grey's Anatomy: canceled or renewed?, How to Get Away with Murder, How to Get Away with Murder: canceled or renewed?, Match Game (2016), Match Game (2016): canceled or renewed?, Modern Family, Modern Family: canceled or renewed?, Shark Tank, Shark Tank: canceled or renewed?, Single Parents, Single Parents: canceled or renewed?, Speechless, Speechless: canceled or renewed?, Splitting Up Together, Splitting Up Together: canceled or renewed?, Station 19, Station 19: canceled or renewed?, The Conners, The Conners: canceled or renewed?, The Goldbergs, The Goldbergs: canceled or renewed?, The Kids Are Alright, The Kids Are Alright: canceled or renewed?, The Rookie, The Rookie: canceled or renewed?